After hearing at length from the developer overhauling Cross Street Market – how there will be a wine-tasting area and “a boutique beer-tasting concept,” how if Starbucks came there it would be attractive and “an homage to the original Starbucks” in Seattle – the audience last night exploded. The market clearly needs a facelift, South Baltimore resident Bob Riley said at a gathering of about 200 people in Leadenhall Baptist Church. As someone who has enjoyed high-end food halls like Eataly, Riley noted, he’s not averse to foodie-ish change. “But if improvements are made by stepping on the throats of my friends and my neighbors, I’ll never go in,” he declared to applause. What drew many to the standing-room-only meeting was the recent announcement by the developer, Caves Valley Partners, of Towson, that the market would not be closed “in stages” as previously promised. Instead the 17 merchants who sell cheese, fresh fish, produce and other items, would all have to vacate during the project which remains on schedule. Demolition is expected to start in May, and construction is projected to last 10 months, with the market reopening in spring 2018. The developer’s offer to help them find space at the city’s Hollins Market or Lexington Market is cold comfort, say the merchants, who believe their customers would never find them there. Moving or simply shutting down for 10 months, they say, would be essentially a retail death sentence. 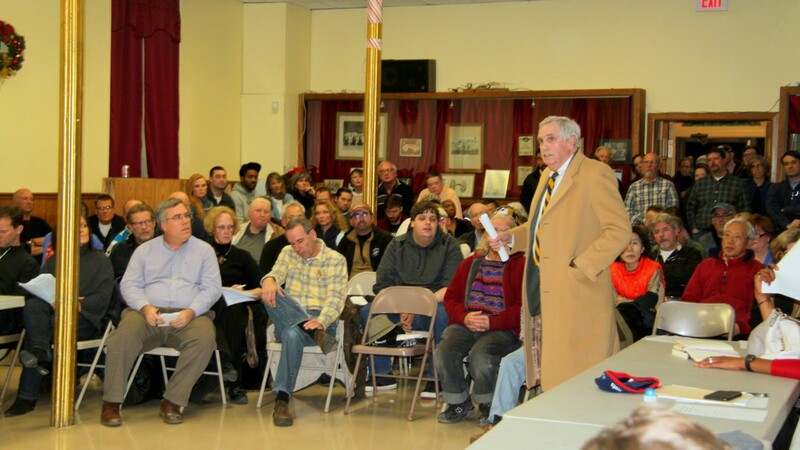 “You’ve spent an hour-and-a-half talking about your plans, the ingress and egress – what about the people?” said the merchants’ attorney, John C. Murphy, standing up in the audience. “These are your community,” Murphy said, addressing the panel assembled by the City Hall point man for the market makeover, Councilman Eric T. Costello. “There has been no assurance as to how the merchants are going to survive this process,” said Murphy, who said more than 70 people are employed by the small businesses he represents in the city-owned market. Riverside resident Deborah Flavin warned the developers not to mismanage what she called the market’s greatest asset – its vendors. 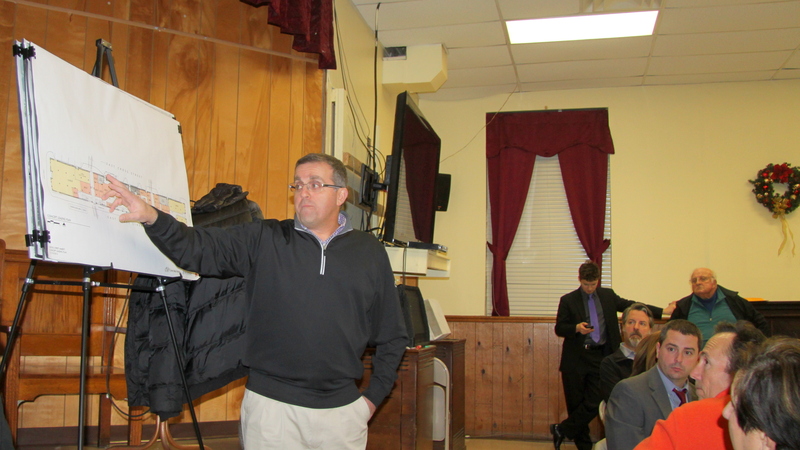 For Caves Valley principal Arsh Mirmiran, the evening meeting of the Cross Street Market Advisory Committee was an opportunity to both disclose new details about the project and defend himself amid intense criticism from some in the community. He showed renderings of the future market, located on Cross Street between Light and Charles streets. It will have space for 27 merchants in 200- to 500-square-foot stalls, along with a 680-square-foot anchor bar-restaurant at the west end. Mirmiran described communal seating for 200, tall glass windows intended to give the structure a more open look, and outdoor seating at the west end. Costello, who chaired the meeting, was also under fire at times. He responded, for example, to criticism that the committee – which includes political allies, a representative from the Horseshoe Casino and quasi-governmental entities like the Downtown Partnership – includes no current market merchants. 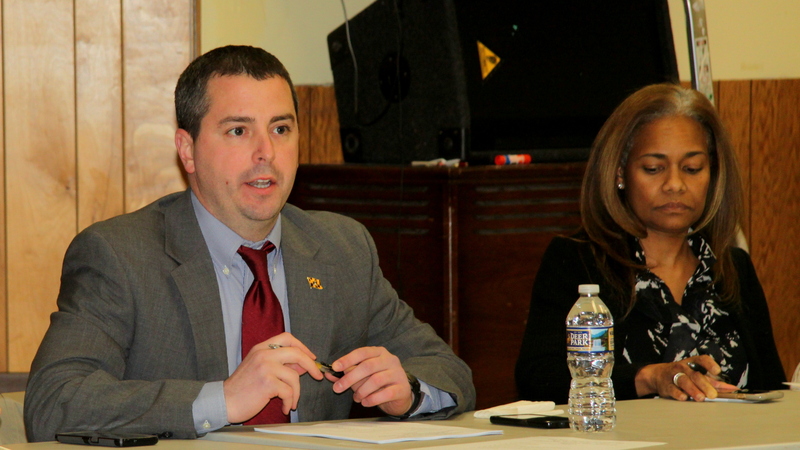 Costello said the merchants were in effect represented by groups on the committee like Federal Hill Main Street and that their lease negotiations might make their involvement in the panel inappropriate. Those negotiations are moving forward after Caves Valley representatives approached the merchants’ attorney yesterday to say he will work out leases. “I don’t know Arsh – he’s been courteous to me,” Murphy said, adding that officials from the city, which is contributing $2 million towards the project, have been less responsive. 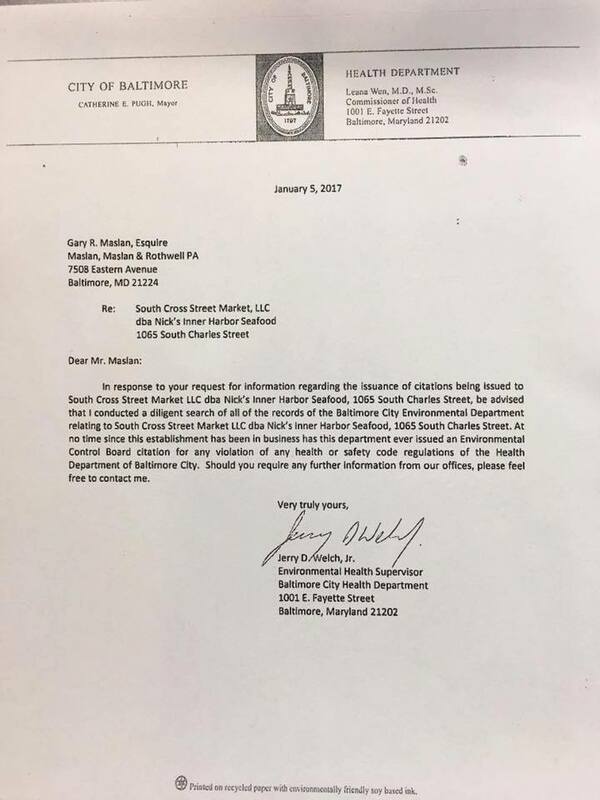 Murphy said he’s had no response to a letter seeking help that he hand-delivered to the mayor’s office and to the Baltimore Public Markets Corporation. Some of the harshest exchanges of the evening were about Nick’s Inner Harbor Seafood, the popular raw bar that on January 1 had its lease abruptly terminated by Mirmiran for what the developer said was too many health code violations. That allegation is “bogus,” said Gary Maslan, attorney for South Cross Street Market LLC, the owner of the business. Maslan acknowledged that Nick’s has had minor violations but was never issued a “citation” and referenced a January 5 Health Department letter saying so. In all, the second letter outlined 195 violations, three of them “critical,” Mirmiran said. Jae Lee, whose family owns Nick’s, spoke briefly as well. “Not a citation – just minor things!” he said heatedly. Maslan said he will probably file a legal challenge to the lease termination next week. In defending his client, one of two market tenants with a liquor license, Maslan also brought up the special license being sought for the redeveloped market. “Arsh stands up there and says ‘I just want a little beer tasting license. I just want a little wine-tasting license,’” Maslan said. It’s a sensitive subject in Federal Hill, where thee is a long history of complaints by some residents about the burgeoning bar scene and massive pub crawls attracting thousands. For the market to obtain the license, legislative action in Annapolis is required to make an exception to a state law put in place to prevent the liquor license saturation in the neighborhood. Several audience members, meanwhile, called on the developer and the city to abandon the special license altogether and simply purchase the existing two liquor licenses, from Nick’s and Big Jim’s Deli. The subject was a painful one for Beth Hawks who said she moved her business out of Federal Hill because the atmosphere changed from family-friendly businesses to bars catering to the young. “The only way you’re going to protect the market from the pub crawls,” Hawks said, “is if you build a moat around it.